Rev. 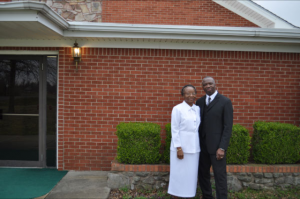 Bobby L. Thomas, Sr. is married to Rev. Sallie J. Thomas. They have been active Pastors for the past six years: two years in Cairo, Georgia and four years in Kennett, Missouri. Rev. Bobby Thomas served three years in the U.S. Army, and then returned to school and earned his Bachelor of Arts in Business Administration. He served as Assistant Pastor in Temple TX, for eight years. Rev. Thomas is very active in the community and presently serves on the Public Safety Community Advisory Committee in the City of Kennett. Rev. Sallie Thomas is retired military U.S. Air Force and earned her Bachelor of Arts in Business Management. In addition to their pastoral duties, Reverends Thomas work part-time as substitute schoolteachers. This church also plays an active role in supporting international missionary efforts.